Love rice cereal treats? Chocolate? The two mixed together are simply delightful. 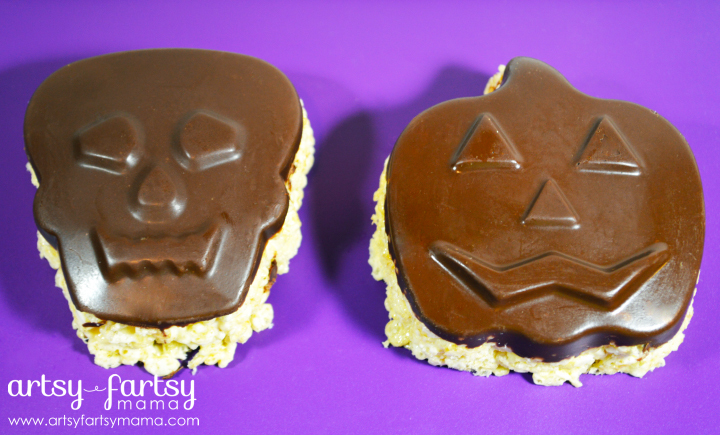 Rice cereal treats are one of the easiest treats to make, and with just a few extra steps, you can create something that looks super festive for Halloween!! Melt the entire bag of chocolate chips in a double boiler or microwave. Spray pan and pour enough chocolate to cover just the bottom 1/4-1/2 inch of the cake pan (enough to cover the faces). There will be chocolate left over. Remove from heat and set aside. Place in the freezer for the chocolate to set. To make the rice cereal treats, start by melting the butter in a large saucepan over low heat. When the butter is melted, add the marshmallows and stir until completely melted and remove from heat. Add the rice cereal and stir until all the cereal is coated. Start re-melting the chocolate. Get pan out of the freezer, and add a few drops of the melted chocolate over the frozen chocolate to help the rice cereal treats stick to the chocolate. Immediately spoon some of the rice cereal treats into the cake mold using a buttered or sprayed spatula or spoon. Repeat until all the molds are filled. *Press any extra rice cereal treats into a greased pan or bowl to eat later when the kids go to bed. Keeping your fingertips wet, lightly press all the rice cereal treats into the mold until they are level. Place in the freezer for 20 minutes or so, then run a butter knife around the edges of the molds. Then, carefully turn the pan over and tap it over another pan or plate. The treats should pop out, but if they don't, just keep trying. They sometimes stick a little. You can substitute the mini marshmallows with 10 oz regular marshmallows or 7 oz marshmallow creme. Store in an airtight container for a few days, or freeze for up to 6 weeks. oh my gosh, what a cute idea. 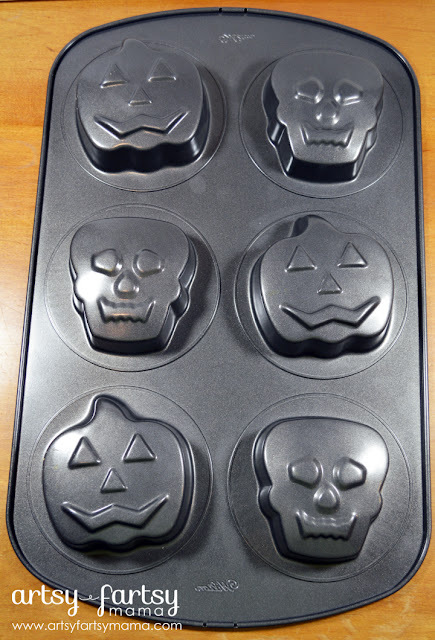 I am loving all these molds i've been seeing for halloween, and now I am definitely think I need to get some. Plus, I love rice krispies! Oh my gosh, those are so cool! My grandsons would love them. Who am I kidding? I love them!! Oh how fun - great idea! They look so yummy! Thanks for linking up to my party!